Pot racks improve space utilization. Take advantage of overlooked, unused space above work tables and on empty kitchen walls. 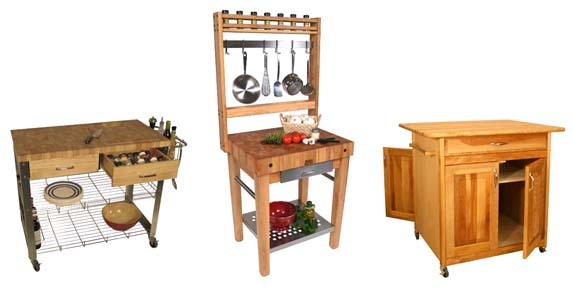 First, check out these three exquisite Boos end-grain butcher block work stations already outfitted with attractive and highly functional pot racks that are perfect for hanging pots, pans and large utensils out of the way, but within arm’s reach. There’s the Cucina Premo and the Boos Pro Prep Block in either maple or cherry. All three Boos also include bars on the sides of the prep table from which you can hang utensils and small kitchen ware. Another fabulous option is the more contemporary Boos Cucina Grande, which features a fine-furniture-like Varnique finish and comes with a stainless steel-faced drawer in the center of the table’s apron. And finally, there’s the more institutional-looking but incredibly resolute and productive Cucina Grandioso work station from John Boos, to which you can add a stainless steel pot rack and hooks for an incredibly distinct look. Boos makes two wall-mounted shelves that incorporate pot racks: the Mensola and the double-bar Mensola Grande. Both are stainless steel and double-prong pot hooks, included with the purchase of any pot rack and also sold separately.